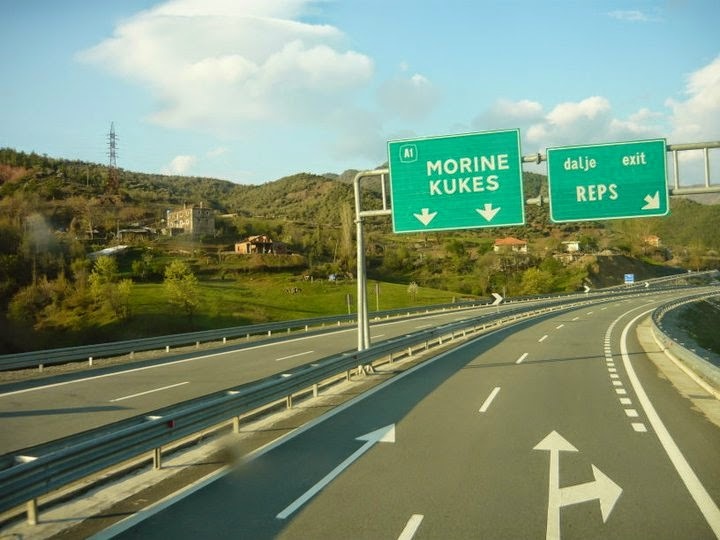 The Albania–Kosovo Highway links Kosovo to Albania's Adriatic coast: the Albanian side was completed in June 2009, and now it takes only two hours and a half to go from the Kosovo border to Durrës. Overall the highway will be around 250 km (155 mi) when it reaches Prishtina. The project was the biggest and most expensive infrastructure project ever undertaken in Albania. The cost of the highway appears to have breached €800 million, although the exact cost for the total highway has yet to be confirmed by the government. Two additional highways will be built in Albania in the near future: Corridor VIII, which will link Albania with the Republic of Macedonia and Bulgaria, and the north-south highway, which corresponds to the Albanian side of the Adriatic–Ionian motorway, a larger regional highway connecting Croatia with Greece along the Adriatic and Ionian coasts. When all three corridors are completed Albania will have an estimated 759 kilometers of highway linking it with all its neighboring countries: Kosovo, the Republic of Macedonia, Montenegro, and Greece. The civil air transport in Albania marked its beginnings in November 1924, when the Republic of Albania signed a governmental agreement with German air company Deutsche Luft Hansa. On the basis of a ten-year concession agreement, the Albanian Airlines Company Adria Aero Lloyd was established. In the spring of 1925, the first domestic flights from Tirana to Shkodër and Vlorë began. In August 1927, the office of Civil Aviation of Air Traffic Ministry of Italy purchased Adria Aero Lloyd. The company, now in Italian hands, expanded its flights to other cities, such as Elbasan, Korçë, Kukës, Peshkopi and Gjirokastër, and opened up international lines to Rome, Milan, Thessaloniki, Sofia, Belgrade, and Podgorica. The construction of a more modern airport in Laprakë started in 1934 and was completed by the end of 1935. 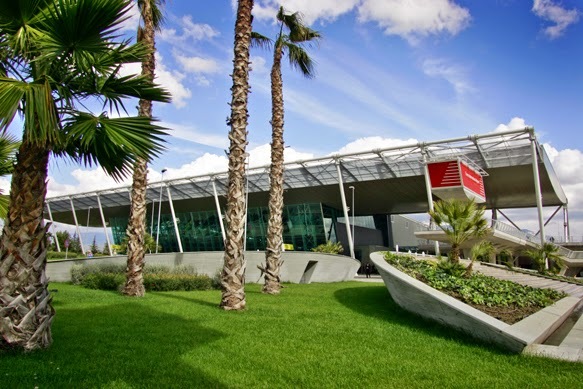 This new airport, which was later officially named "Airport of Tirana", was constructed in conformity with optimal technological parameters of that time, with a reinforced concrete runway of 2,700 m (8,858 ft), and complemented with technical equipment and appropriate buildings. During 1955–1957, the Rinasi Airport was constructed for military purposes. Later, its administration was shifted to the Ministry of Transport. On 25 January 1957 the State-owned Enterprise of International Air Transport (Albtransport) established its headquarters in Tirana. Aeroflot, Jat Airways, Malév, TAROM and Interflug were the air companies that started to have flights with Albania until 1960. During 1960–1978, several airlines ceased to operate in Albania due to the impact of the politics, resulting in a decrease of influx of flights and passengers. In 1977 Albania's government signed an agreement with Greece to open the country's first air links with non-communist Europe. As a result, Olympic Airways was the first non-communist airline to commercially fly into Albania after World War II. By 1991 Albania had air links with many major European cities, including Paris, Rome, Zürich, Vienna and Budapest, but no regular domestic air service. A French-Albanian joint venture Ada Air, was launched in Albania as the first private airline, in 1991. The company offered flights in a thirty-six-passenger airplane four days a week between Tirana and Bari, Italy and a charter service for domestic and international destinations. From 1989 to 1991, because of political changes in the Eastern European countries, Albania adhered to the International Civil Aviation Organization (ICAO), opened its air space to international flights, and had its duties of Air Traffic Control defined. As a result of these developments, conditions were created to separate the activities of air traffic control from Albtransport. Instead, the National Agency of Air Traffic (NATA) was established as an independent enterprise. In addition, during these years, governmental agreements of civil air transport were established with countries such as Bulgaria, Germany, Slovenia, Italy, Russia, Austria, the UK and Macedonia.